Kazuchika Okada wins the trophy, while Jeff Jarrett joins the Club. New Japan Pro Wrestling seems to be on quite a roll lately. In the past year or so, theyve announced partnerships with both Ring of Honor and Jeff Jarretts Global Force Wrestling. Furthermore, theyve been airing their major events in the United States via iPPV. On August 10th, New Japan wrapped up their annual G1 Climax tournament -- or Grade One Climax -- which began on July 21st. This year was the 24th incarnation of the prestigious event -- although NJPW held annual tournaments beginning in 1971 under different monikers. The shows consistently draw sold out crowds and mainstream Japanese press for each night of the event. As per usual, this years event featured fantastic wrestling from all involved -- including well-known American stars like Shelton Benjamin, Doc Gallows, Davey Boy Smith Jr., and current IWGP Heavyweight Champion, AJ Styles. The tournament also featured well-known Japanese stars Satoshi Kojima, Yuji Nagata, Shinsuke Nakamura, Kazuchika Okada, Hiroshi Tanahashi, and Hiroyoshi Tenzan, among others. The G1 series is contested under round-robin tournament rules, wherein wrestlers are separated into two blocks of competitors who then compete against each contestant in turn. Wrestlers accrue points for victories, with the winner of each block being the combatant with the most points. The winners from each block then face off in a final contest. This year saw Kazuchika Okada claim victory in Block B, while Shinsuke Nakamura toppled the A Block competitors. The two met in a thrilling contest to end the tournaments final show on Sunday. Okada defeated Nakamura after delivering a devastating Rainmaker lariat. After the bout, Okada vehemently told AJ Styles that he was coming for him and the IWGP Heavyweight Championship. However, the big news coming out of the tournament is the shocking actions of Jeff Jarrett and his supposed right-hand man, Scott D'Amore. During intermission, Jarrett and D'Amore signed an official agreement with NJPW and cut a very enthusiastic, face promo. Later in the evening, after AJ Styles' match with Hiroshi Tanahashi, the Bullet Club came out to wreak havoc. The Bullet Club is New Japan's most dominant faction consisting primarily of gaijin wrestlers -- foreign to Japan. The group was founded by Prince Devitt -- WWE's latest signee -- in May 2013. 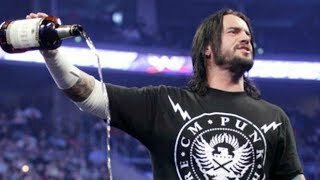 Since then, numerous other wrestlers have joined the group, including AJ Styles. During the beat down, Jarrett and D'Amore hit the ring. With Jarrett carrying a guitar case, fans assumed Double-J was there to make the save and run off the Bullet Club. D'Amore opened the guitar case and handed the six-stringed instrument to Jarrett. The guitar was revealed to have a Bullet Club logo on it, before Jarrett smashed it over Tanahashi's head. Jarrett has become the newest member of the dreaded Bullet Club. It will be interesting to see what his role will exactly be -- whether as an active competitor or more of a mouthpiece for the group. Furthermore, a deal between Jarrett's Global Force Wrestling and New Japan has already been established. Is this a sign that the Bullet Club could make their way across the Pacific to compete in the States for GFW with Jarrett leading the charge? 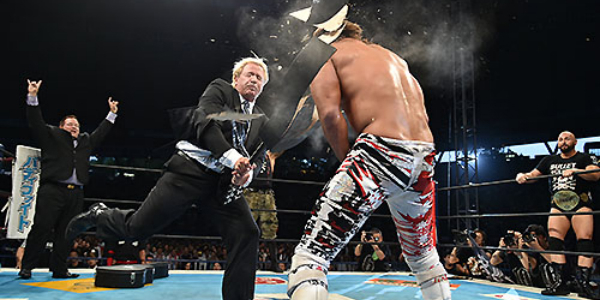 Let us know your thoughts below on the G1 Climax series of events and this shocking turn by Jeff Jarrett.